A new version of scheme bricks is under way, planned to be tested out with slub on the Mozilla Fest Party, then taken across the Atlantic for some more livecoding action in Mexico City! New things include blocks with depth – cosmetic for the moment, but I plan to prototype some new ideas based on this, separately zoom-able code blocks, and most importantly it’s a complete rewrite into functional R5RS Scheme for portability – it should now be relatively simple to get it on android via Nomadic which uses Tinyscheme. 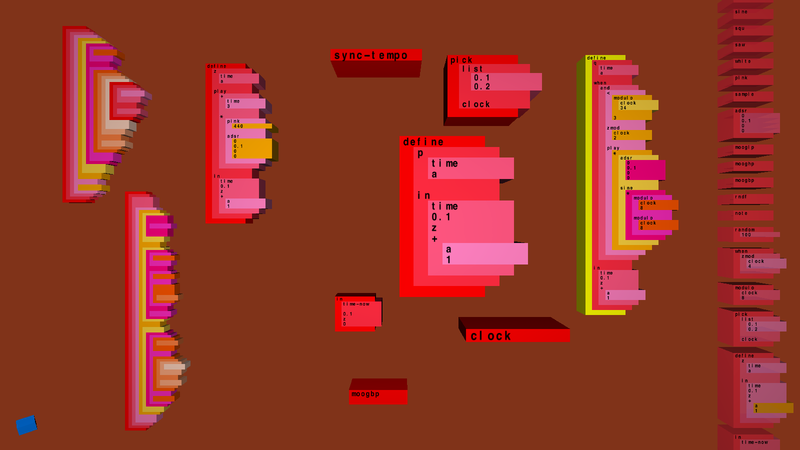 Using the new temporal recursion, the code produced is much less monolithic. Massively tall structures resulting from plugging together sequences during long performances were a bit of an issue before, but splitting the code into a multitude of functions (which can be shrunk and put in the “background”) seems to be a far easier way of working so far.